DIAL SIZE: 1½" and 2"
Standard single scale dials have a green background, white letters and red Use No Oil. Other scales and special configurations can be custom built to your specifications. For more information, contact us at 800/323-5111. 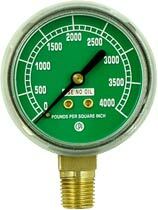 Other flow gauges can be custom built to your specifications.